The Princeton Review ranked The University of Alabama No. 10 in the nation and No. 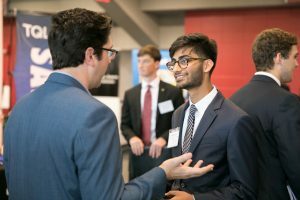 1 among Southeastern Conference universities on its 2019 list of America’s best colleges for internship placement. UA’s Career Fair provides students with the opportunity to network with potential employers. UA’s Career Center provides students with ample knowledge, training and networking opportunities for those seeking to develop their professional profiles through internships. The center maintains a working relationship with numerous employers in various industries, including corporate and private business, government agencies and nonprofit organizations. Students are also encouraged to speak to their academic advisers about internship opportunities. Each academic department strives to provide up-to-date internship postings through its respective websites or in its campus buildings. The Princeton Review’s ranking was determined by students’ ratings of accessibility of internship placement services at their institutions.